Located in Atlanta, Georgia, Wahoo Fitness has created a full ecosystem of sensors and devices for the runner, cyclist or general fitness enthusiast. Its award-winning line of products includes KICKR and KICKR SNAP indoor bike trainers and the new KICKR CLIMB. KICKR CLIMB is designed to take KICKR indoor training to the next level by adding physical grade changes to your ride. Complete the challenge to have a chance to win a Wahoo KICKR with CLIMB. The world isn’t flat; now neither is your ride! The winner is Michel Vie, aka „ardgallen“. More details on Facebook. Great job and good luck to all next time! 1 random draw for new Wahoo KICKR + CLIMB for all riders who complete the challenge. Climb at least 13,000 m indoors during the Challenge period. Prizes are to be shipped to the winner within three months after the result of the drawing is announced or when available. Prizes are not exchangeable for money and are to be shipped to the winner(s) by Wahoo Fitness according to standard shipment terms to their country. 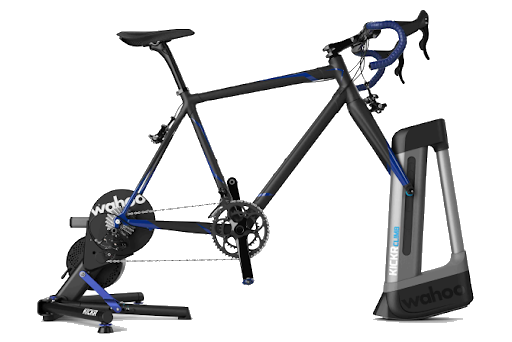 The latest innovation from Wahoo will literally take your indoor training to the next level! KICKR CLIMB indoor grade simulator is designed to work exclusively with the new KICKR and new SNAP, and when paired, it will add physical grade changes to your indoor training. The CLIMB is compatible with Third Party Apps, so whether riding a virtual course or performing a structured workout, KICKR CLIMB blends ascents and descents with resistance changes for a truly immersive indoor training experience. The world isn’t flat; now neither is your ride!